I’m back again with more details about how I transformed my son’s nursery into a girlie space for our latest addition. 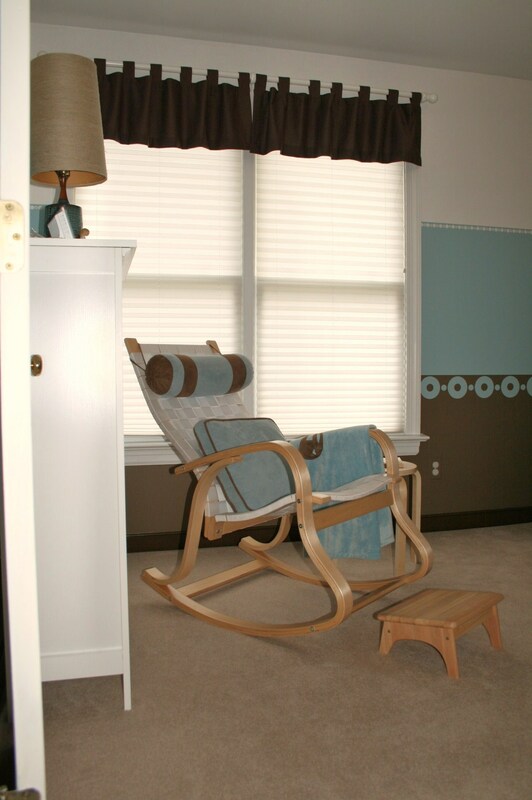 One of my favorite spots to rest in our whole house is the rocker in our nursery. 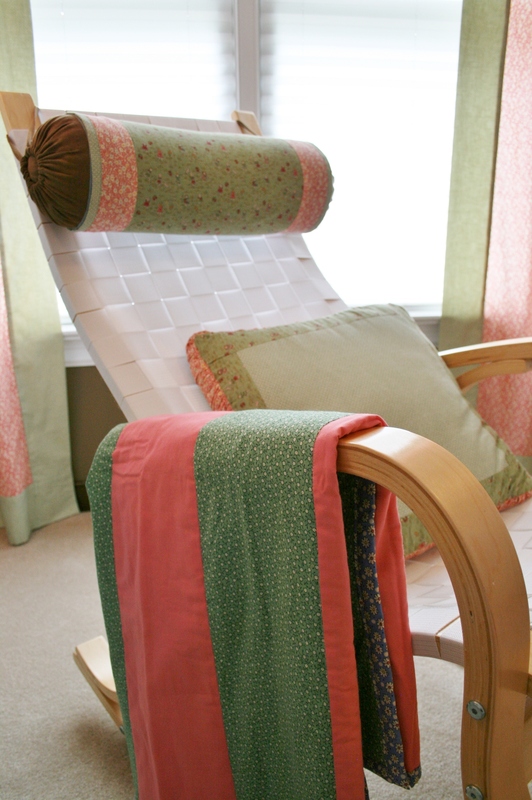 It’s a cool bent wood number with woven white fabric webbing. While very comfortable for relaxing it needed a little padding when it came time for nursing little ones. For my son’s room I was able to find a neck roll and matching pillow at Wal-Mart in nearly the exact same colors of the room. So, for the first time around the case was closed, problem easily solved…done. 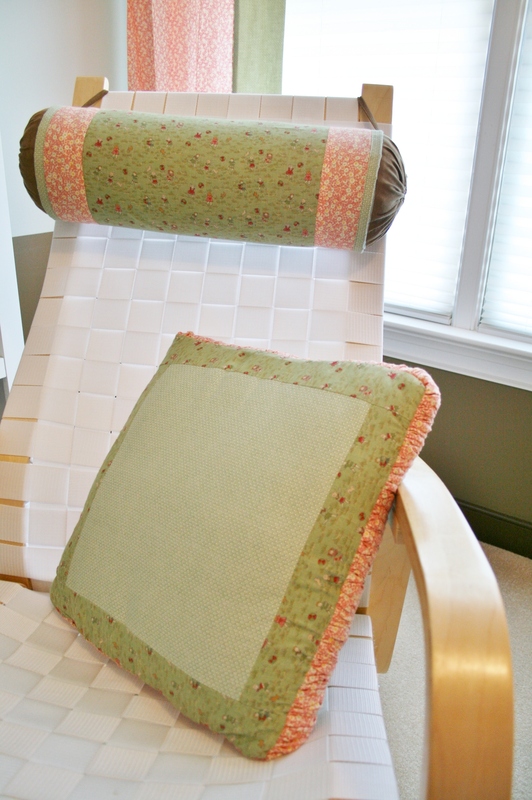 This time I wanted to reuse those same pillows, but help them stand out in the new space for the right reasons. After finding some sweet fabric in my stash in shades of pink and green with vintage reproduction prints, I knew I was in business. 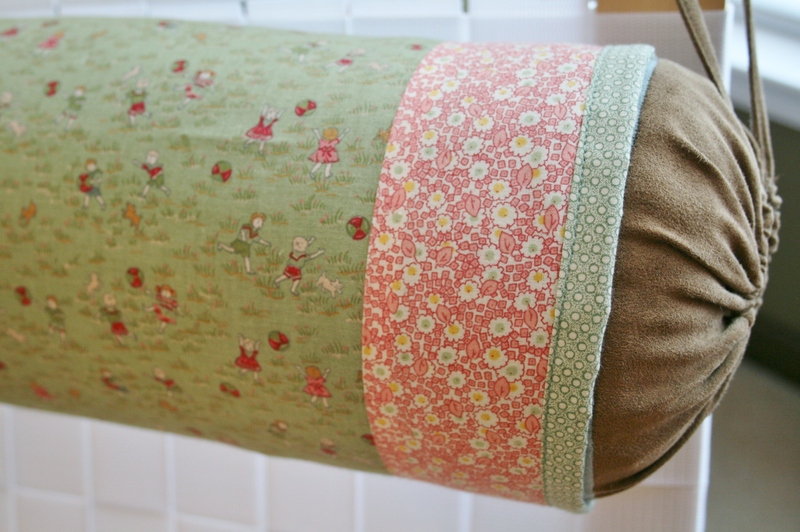 This time around I wanted to add a ruffled edge to the side/casing of the pillow. I figured that doing this would help camouflage the thick piping that would be just under the surface. 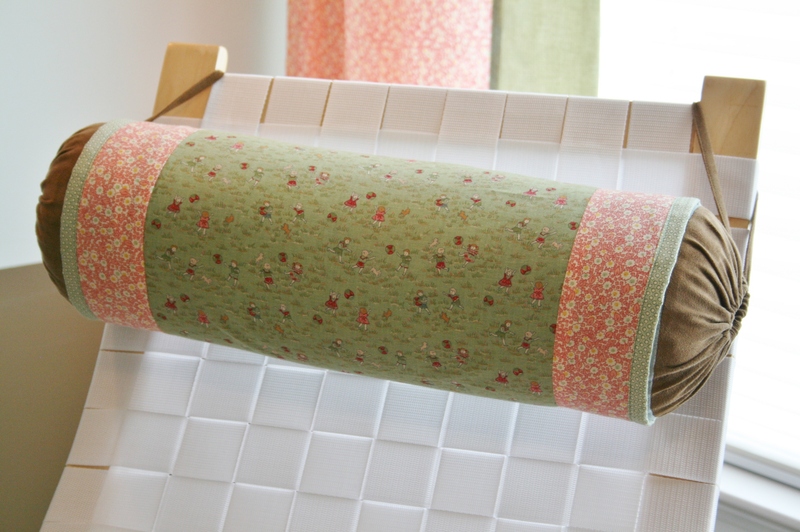 After measuring the width of the casing and around the pillow, I cut out strips of fabric. In order to get a lot of ruffle, I think I nearly quadrupled the measurement from around the pillow when cutting the length of the strips. 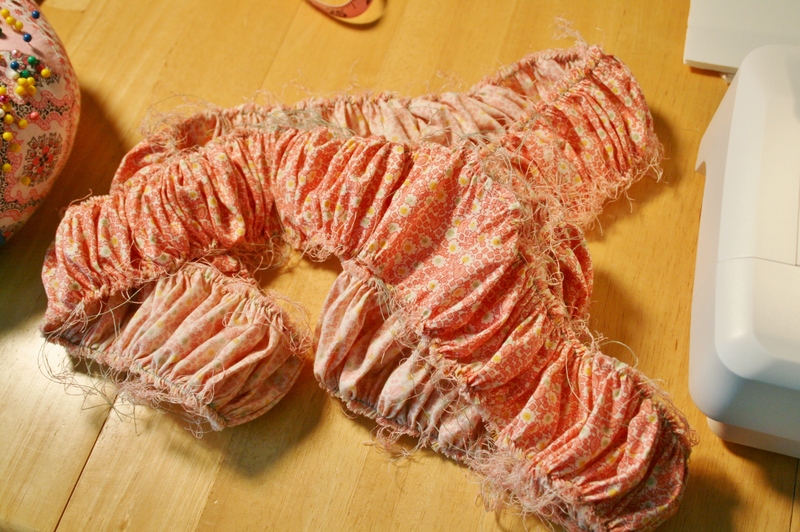 Once the strips were all sewn together I commenced basting the edges and then gathering…. ….and gathering, and gathering, and gathering. I think it literally took me an entire afternoon of gathering the edges to get it down to the actual length I needed. Once I had the length I went back and ran a stitch along the gathered edge to make sure the whole thing did not come undone. I had visions of my toddler finding the piece and pulling it all apart! He would have had a field day, while I simply had a heart attack. For the front and back cover I decided to do a middle square framed in a contrasting fabric. 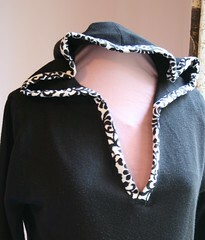 To keep things simple I did not miter the corners- it seemed like a bit much along with the ruffled edge. 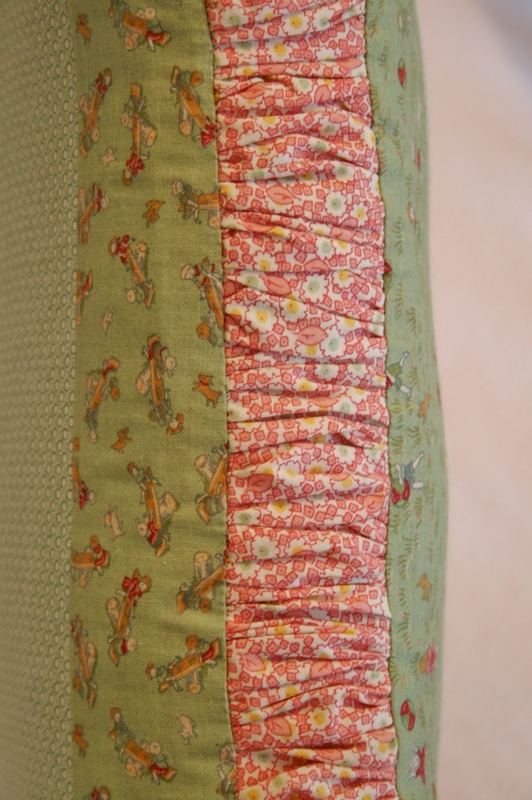 The border is about 2″ all the way around and I attached two pieces on opposite sides cut to the same length as the middle panel. Then, I just made the other two opposing sides long enough to run the length of the middle panel of fabric, as well as, those two border strips. Easy-peasy! 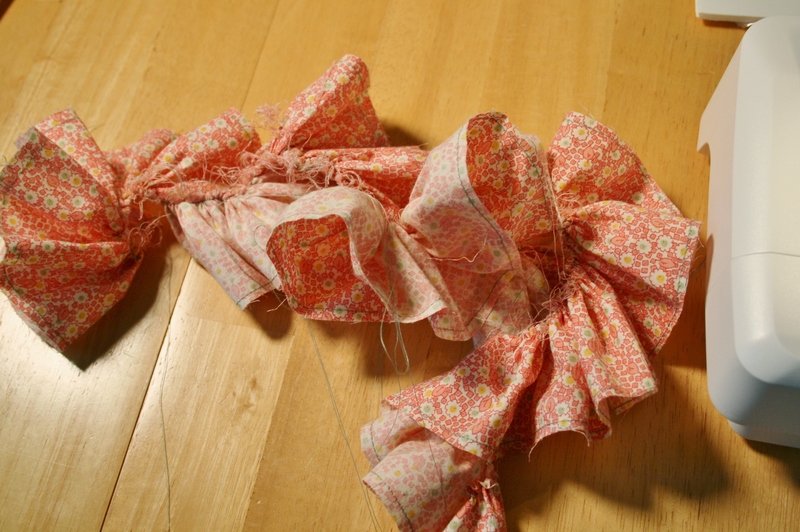 Once the middle panels were put together I attached the ruffled casing. If you want to make something similar, just be sure to put right sides together and take your time at the corners to be sure you don’t end up with offset corners running from front to back. When stitching the last side up leave a small opening so you can turn the whole thing right side out. 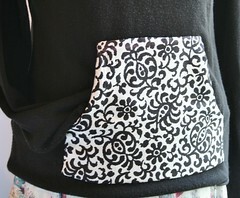 Insert (or rather STUFF) the pillow through the hole, smooth it out and then whip stitch the hole closed by hand. Done! 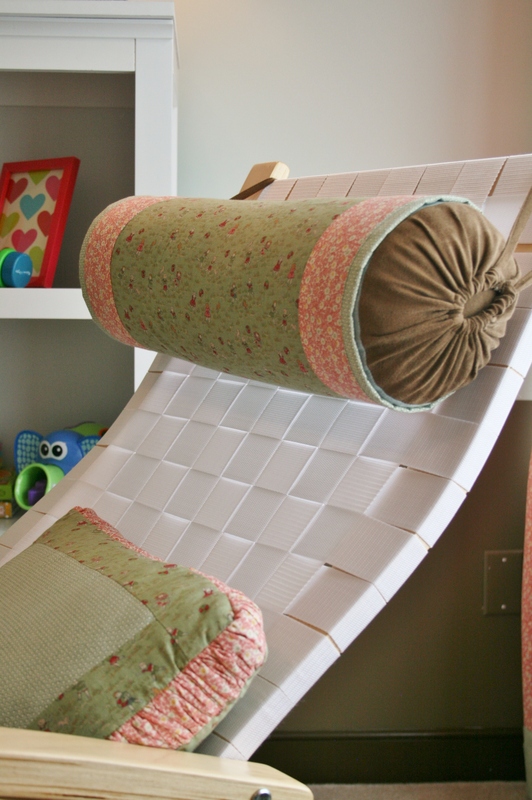 A very easy update and this pillow continues it’s usefulness in the nursery, complementing the rest of the space without being to matchy-matchy. For the neck roll pillow I decided to only cover the blue middle section. Doing this allowed for the brown trim to still show through, again keeping things from being to much of a matched set, and it also left the ties available for looping over the back of the chair. I’m all about making things work in the easiest way possible. So, I measured the length of the blue section and then around the pillow. Using those measurements I cut a center piece of fabric and two strips of contrasting fabrics to border the edges. 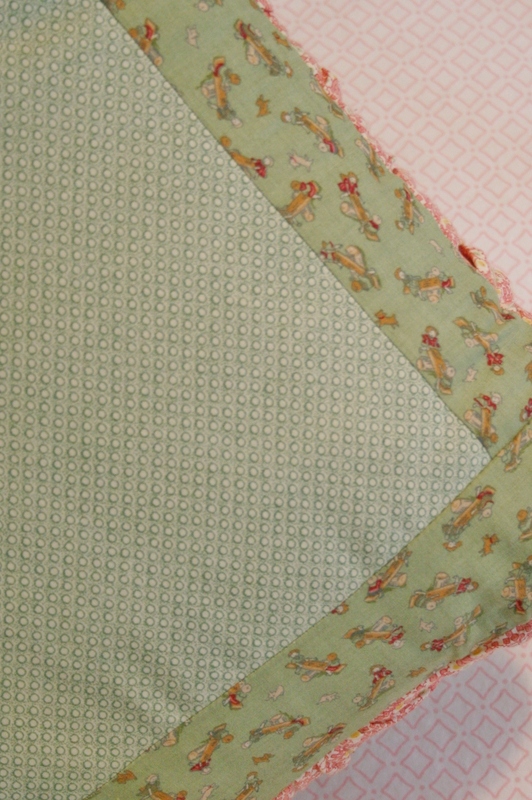 The middle fabric is similar to the other vintage reproduction “children at play” pattern seen in the regular pillow tweak above. The pink border is the same as the ruffled edge of the regular pillow, as well as the curtains in the background. 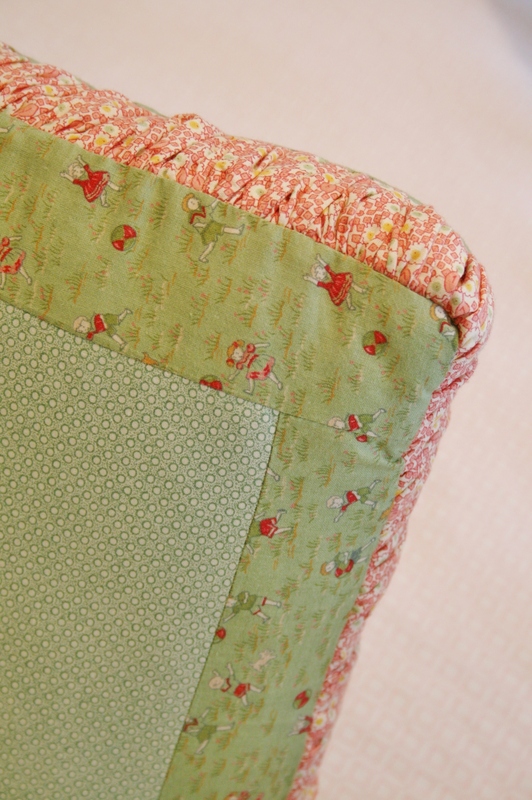 And, the very edge of the neck roll cover was made from the same fabric as the middle panel of the regular pillow and the border of the curtains. Since the neck roll was still sporting the brown ends and ties I wanted to make sure that the edges of the cover did not become frayed. So, I was sure to fold those over and stitch them up like a quilt binding. That way when I need to throw it in the wash the whole thing does not unravel. Once the tube cover was made I just slipped it over the neck roll pillow, lined up the edges to cover up the entire blue section of the old pillow and that was it! Nothing over the top, but definitely a different feel. Have you guys tweaked anything for your homes lately? PS – For more details about the rest of the nursery renovation please click on over to my home/DIY site, Kitsch Designs.